It's 2018, yet the majority of radiology groups schedule their physicians manually. "The most frequently used method is to do it by hand, spreadsheet, or Excel sheet," says Suvas Vajracharya, PhD, CEO and founder of Lightning Bolt Solutions, Inc, which provides scheduling software to physician practices including radiology groups. Many physicians, including radiologists, are reluctant to hand the task off to administrative personnel "because they don't trust all the nuances and complexity of scheduling or work-life balance requirements to someone who doesn't live it," Vajracharya says. The physicians who are scheduling for the practice "are likely to have done it for many years and believe they alone have become experts at unraveling the labyrinth of their work schedule." They believe turning it over to technology "is risky, too, because they doubt a system can handle the subtle nuances and complexities," Vajracharya says. It's too bad that this attitude prevails, say Vajracharya and others, because technology can help resolve some important scheduling issues with today's radiology practices, as it has for other industries. First, he says, radiologists who are tasked with scheduling are spending time on administrative work that could be spent reading studies. In today's health care environment, physicians need to spend more time on the clinical rather than the administrative side of their practice to be productive and profitable but, often, that's not happening, Vajracharya says. Also, faced with more studies, fewer resources, and less compensation, many physicians, including radiologists, are headed for burnout. A study/assignment system that distributes the work evenly and takes into account a radiologist's licenses, credentials, and subspecialty training—whether he or she is reading onsite or remotely—can be a game changer, experts say. "I do believe that employing automated study assignment technology not only contributes to radiologists' satisfaction with their jobs, but it also can reduce burnout and lead to better patient care," says Shannon Werb, president and chief operating officer of vRad, a MEDNAX Company, based in Minneapolis. The latest technology, says Tomer Zonens, worldwide product line manager of health care information solutions for Carestream, offers a new paradigm for radiologists' scheduling that can optimize reporting time. Carestream introduced its Workflow Orchestrator at RSNA 2017 and was poised to begin shipping the product as this edition of Radiology Today went to press. Traditionally, radiologists sign on to PACS, open worklists, and look for the studies they should read next. Workflow Orchestrator does it the other way; each exam "looks for" the most appropriate clinical specialist on duty. "When an exam comes into the system, we have rules that tag it," Zonens says. The tool is designed so that its first step is to assign the exam to the most appropriate radiologist who is logged onto the system. Should that radiologist not be able to read the exam within the required turnaround time, the exam is made available to a broader audience of subspecialists until, eventually, it is exposed to all radiologists who are logged on who have the credentials to read it. Exams also can be assigned to specific radiologists, according to a referring physician's preference and existing affiliations with hospitals or health care facilities. Zonens believes Workflow Orchestrator helps eliminate "dead space or time spent by radiologists doing nonmedical tasks. They don't have to figure out: Should I read this or should I do another one next?" Radiologists are not only able to focus on what they are trained to do, the tool prevents them from being overloaded with studies or even underwhelmed at times, Zonens says. vRad also has a system to assign and prioritize studies to its radiologists' worklists. On a typical night, the system distributes more than 1,000 studies an hour to up to hundreds of radiologists reading simultaneously. Distribution is based on a number of factors including licensing, credentialing, subspecialty, study urgency, radiologist preferences and abilities, and specific patient presentations. Only those studies that a specific physician should be reading will appear on his or her worklist. "Every worklist at vRad is individualized, yet multiple radiologists are available to read each study," Werb says. Each study that arrives is assigned an expected turnaround time. If studies that are more urgent are waiting for too long, the system assigns the study to additional physicians. "Our physicians know that for every study on their worklist, there is at least one other physician in the practice who is available to read it," Werb says. "Knowing they have backup helps take some of the pressure off." vRad's worklists are managed to ensure that the right number of studies are on the radiologists' worklists, Werb says, "so no radiologist is left empty, nor buried in too many studies." 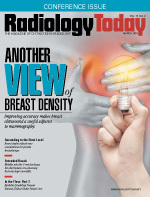 Werb believes providing the appropriate type and number of studies helps vRad's radiologists avoid feeling overwhelmed. When worklists contain the right mix of studies matching each physician's preferences and capabilities, it ultimately creates the best possible outcomes for patients, he says. Alexandria Contreras is operations manager for Longhorn Imaging, which has three MRI facilities in Texas: South Austin, Central Austin, and Cedar Park. The practice sees about 40 patients a day between its three locations. Longhorn has two different radiology groups and four individual radiologists who read its studies. The practice uses Konica Minolta Healthcare's Exa PACS/RIS to schedule and assign studies to its radiologists. When physicians send a referral for a patient to receive a scan, they will write their preferred radiologist, if they have one, on the referral. That way, Longhorn knows who to assign the study to, Contreras says. The referring physicians' preferences are noted and kept for future assignments. "We have an ongoing list of referring physicians and their preferred radiologists," Contreras explains. "Anytime that physician sends an order, we go and see who their preferred radiologist is. Then, we assign that radiologist to read the study." Currently, Longhorn manually keeps track of scheduling and preferences with an Excel document, "but we are working on being able to put it into the system," she says. As operations manager, Contreras says, she audits the schedules to verify the correct radiologists are assigned to read the appropriate patient study. Vajracharya says having some flexibility in scheduling also helps relieve stress and avoid burnout. "When you schedule radiologists who are subspecialized, such as neuroradiologists, your immediate choice is to put the best radiologist available to read neuroradiology studies," he says. "But you also have to consider whether that radiologist has read several complex cases a week. Are you overemploying this subspecialist because she's really good? There are times when you need to go to your secondary or tertiary choices, depending on time-off requirements or how many times that primary physician has been reading during the week or month." The radiologist's location also should be a factor in scheduling, Vajracharya says. "If you have a radiologist who worked in the morning at one location, you want to avoid having the same radiologist travel a distance in the afternoon to read studies at another site," he says. Also, if one radiologist has worked an overnight shift, "you don't want him scheduled for early the next day," he adds. "In general, human schedulers struggle to balance work amongst radiologists who are not interchangeable because of their subspecialties." While many of these scheduling "rules" are standard across groups, it's best to customize for each practice, Vajracharya says. "When we first start with a new client, we ask work-life balance questions, as well as business requirements that are important to the practice, and build a schedule that best meets all its variables." Lightning Bolt's software uses artificial intelligence to help establish the "hundreds of rules" that should govern its scheduling for that practice. Lightning Bolt's most common type of client is a group of radiologists who are part of a larger health care organization, eg, the VA or Geisinger Health System. "But we have private practices and medical groups as small as four and an average of about 20 radiologists," Vajracharya says. "Surprisingly, even when you have four doctors, scheduling can be overwhelmingly complex when you are scheduling without the help of artificial intelligence." Walid Adham, MD, is president of Synergy Radiology Associates, based in Houston, a practice of about 90 radiologists, including those who are subspecialists: neuro, body, musculoskeletal, breast, thoracic, cardiovascular, pediatric, and interventional. The group serves 11 hospitals and several outpatient imaging centers in the Houston area as well as a large number of freestanding emergency centers throughout Texas, Arizona, and Colorado. It provides 24/7 coverage, 365 days a year. "We do a very large amount of teleradiology," Adham says, "but we also make sure we have enough radiologists at all our facilities to meet onsite requirements for fluoroscopy and interventional radiology." Almost all of the practice's radiologists have workstations at home so they can work remotely, if necessary. As a MEDNAX-affiliated practice, Synergy is planning to use vRad's platform, which will make the enormous task of scheduling its radiologists around the clock much easier and more efficient, Adham says. "It will also help to make our schedule equitable to everyone," he says. In addition to using software, Synergy employs other practices that not only ensure turnaround times for radiology reports, but also maintain radiologist satisfaction, Adham says. While Synergy uses software for scheduling, three physicians and an administrator oversee the task. "It's very difficult to have a computer know all the nuances of radiologists' skill sets and hospital meeting schedules," he says. "So, while we use scheduling software—and we find it to be really great—you do have to have oversight." Synergy requires all of its radiologists to be credentialed to read at all its sites. "That's the first step," Adham says. Also, he says, "we make sure we have enough of all our specialists available every day. We provide as much subspecialty coverage as we possibly can while running an efficient practice that allows us to provide turnaround times that our clients demand." Synergy, therefore, runs what Adham calls a hybrid model. If its radiologists were to read only their subspecialty exams, it would make it difficult to provide 24/7 coverage in an efficient manner, he says. So, every radiologist also is required to read "bread and butter" exams—CTs of the brain, right upper quadrant ultrasounds, chest X-rays, etc—as well. Another trick that Synergy employs is seven-on/seven-off scheduling. Radiologists typically, on the evening and overnight shifts, will work for seven days in a row and then have a week off. "We recognize the level of stress a night or evening person works [with], so it makes sense for them to have a lot of time off," Adham says. "Basically, they work half the year and are off the other half." Radiologists who work a seven-on/seven-off schedule have been enthusiastic about it, he adds. "They might try it for a while and then ask us for more traditional scheduling but, once they get away from it, it doesn't take long for them to say they want to go back to it. They like it better," Adham says. "That's an approach that has really worked out well for us, and we are beginning to see day radiologists asking to be placed on that schedule." Adham says that over the last few decades the job of a radiologist has become a lot more impersonal as it has grown more demanding. The radiologist no longer sits in a reading room where physicians wanting a consult come and visit. "Radiologists have very little interaction with clinicians who can call up reports on their computers or iPads," he notes. The loneliness and isolation can lead to burnout, Adham says, and that's why it's important that practices do all they can, including fair and equitable scheduling, to prevent it. — Beth W. Orenstein of Northampton, Pennsylvania, is a frequent contributor to Radiology Today.